We’d love your help. 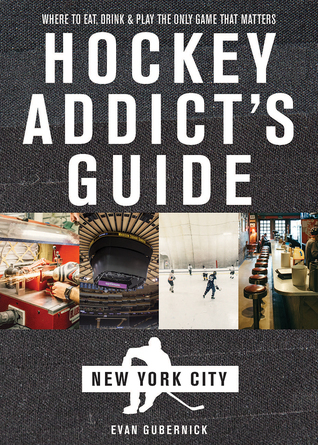 Let us know what’s wrong with this preview of Hockey Addict's Guide New York City by Evan Gubernick. To ask other readers questions about Hockey Addict's Guide New York City, please sign up. I was lucky enough to receive a copy of the book as a gift a few weeks ago, I’ve been loving the care, depth, and research that went into this book. Even though I called New York City home for a decade, even I didn’t know just how much hockey I was missing throughout the Big Apple. Hockey is a great way to meet awesome people, and this book not only gives you places to get in a skate: It gives you some awesome post-game recommendations to turn those meetings into friendships. On top of all that, I was lucky enough to receive a copy of the book as a gift a few weeks ago, I’ve been loving the care, depth, and research that went into this book. Even though I called New York City home for a decade, even I didn’t know just how much hockey I was missing throughout the Big Apple. Hockey is a great way to meet awesome people, and this book not only gives you places to get in a skate: It gives you some awesome post-game recommendations to turn those meetings into friendships. On top of all that, the book does a great job of tying in New York hockey lore and its personalities.